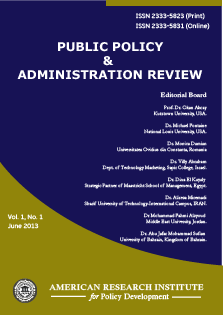 Public Policy and Administration Review is an international peer-reviewed journal published by American Research Institute for Policy Development. The journal aims at exploring the latest developments in public administration and management - translating theory for practice and practice into theory. The journal is truly global in scope, covering developed, emerging and transitional states and all areas of public activity. It welcomes both individual country-based and especially comparative work. The target audience is not just scholars, but also policy-makers and practitioners, including aspiring public sector leaders engaged in education and research in the growing global community. Public Policy and Administration Review strives to draw on the latest research - whether carried out by scholars or practitioners or indeed collaborations. The journal includes not only cutting edge research, but also: feature interviews or opinion pieces from leading scholars and policy-makers; a resources section for scholars and practitioners; occasional symposia and debates; and themed issues of topics of special interest. Proposals in all these areas are always welcome. All research articles in this journal have undergone initial editorial screen and rigorous peer review. Each paper published in Public Policy and Administration Review is assigned a DOI®number, which appears beneath the author's affiliation in the published paper. Click HERE to know what is DOI (Digital Object Identifier)? Click HERE to retrieve Digital Object Identifiers (DOIs) for journal articles, books, and chapters. Dr. Catherina Ku, California State University, USA. Dr. Bakry M. El Medni, Newark, University of Delaware, USA. Dr. Qinghai Gao, Farmingdale State College, USA. Prof. Dr. Elena Andreevska, South East European University, Republic of Macedonia. Prof. Dr. José Matias-Pereira, University of Brasília, Brazil. Dr. Menaf TURAN, Dept. of Public Administration, Yuzuncu Yil University, Turkey. Dr. Roslina Ismail, Universiti Malaysia Terengganu (UMT), Malaysia. Mr. Titus M. Kilonzi, Ministry of Interior and Coordination of National Government, Government of Kenya. Prof. Karaman Zerrin Toprak, Dokuz Eylul University, Turkey. Prof. Mogopodi Lekorwe, University of Botswana, Gaborone, Botswana. Dr Gursharan Singh Kainth, Director, Guru Arjan Dev Institute of Development Studies, India.